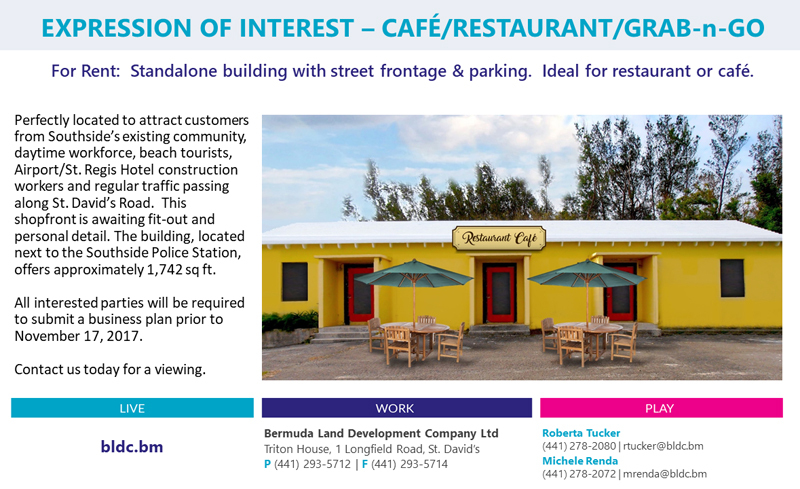 The Bermuda Land Development Company [BLDC] is seeking Expressions of Interest for a building in Southside. The information flyer “For Rent: Standalone building with street frontage & parking. Ideal for restaurant or café. “Perfectly located to attract customers from Southside’s existing community, daytime workforce, beach tourists, Airport/St. Regis Hotel construction workers and regular traffic passing along St. David’s Road. “This shopfront is awaiting fit-out and personal detail. The building, located next to the Southside Police Station, offers approximately 1,742 sq ft. Interested In Developing Tudor Hill Property? Perfect! This can be the new Ellis (lil Walt) Island! Nana Peggy can run it. You are kidding us! Restaurant or cafe? Next to the cop shop? Right, where is the footfall? And that picture – wow talk about photoshopped! I bet the cops would be the best patrons!! Artist impression of what it can look like? Go for it somebody … if you have the resources. Loads of potential at Southside. Great idea! If the road it was on was open from Gate 1 then it would make sense. As is, you’ll have to go down to Gate 2, turn in and back past the police. Unless you’re on a bike and can go through the oleanders.